While I was away for the day, I left my husband to fend for himself and the kids. To my surprise, he sent me a text message with the photo above. I got to try this dish the next day, and it still tasted amazing (apparently he’s been paying attention to me in the kitchen) 😉 I asked what he called this meal, and he said “Chickenavatomato”. It’s silly, but here is what it is. Take 4 cups of cherry tomatoes and blend them to a puree, then strain them. (You can keep the juice for drinking if you’d like). Set the meaty part of the tomatoes aside, and then blend 2 avacados with some cilantro, 2 tablespoons of lime or lemon juice, and a tablespoon of vinegar. Set this aside. Put 2 tablespoons of olive oil in a pan and heat. Lightly season and begin cooking chicken cutlets in the hot pan. When the chicken is about half done, add sliced zucchini and chopped white vidalia onions. Remove the chicken once cooked thoroughly and then cook the veggies (which can be seasoned with salt and pepper if you’d like) for a few more minutes on low heat with the lid on the pan. You can toss a tablespoon of water in the pan to help steam it. Finally arrange plate with avacado layer as your bed. Put the chicken on top of that, and crown with the tomato puree. Chop up some fresh basil and throw it on to to add to the taste. 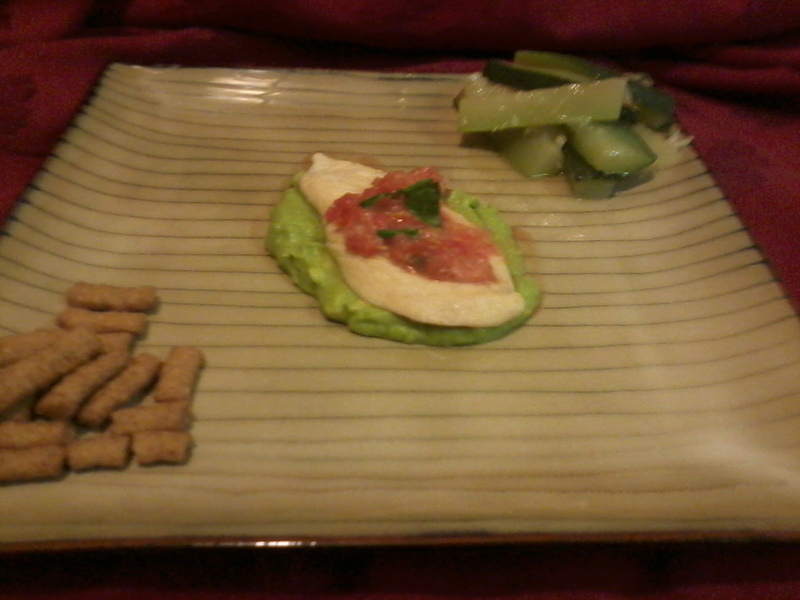 Along side the zucchini and onions, he used sesame crackers to fill out the platter. This was a healthy and low salt meal with lots of natural flavors (tomatoes, basil and zucchini were from our garden). I was also very happy to see that he had even cleaned the kitchen when he was done. 🙂 Enjoy! Now, this looks like something I’d love to wrap myself around!